We spent a couple of hours at East End this morning. The interminable rain had kept us away for several weeks. Erin had been out more recently than I. I have been wrapped up in deadlines and nursing an aching back—I must learn a new technique for root-wrenching and stump-pulling. The sun was brilliant today and we were alone, for the most part. 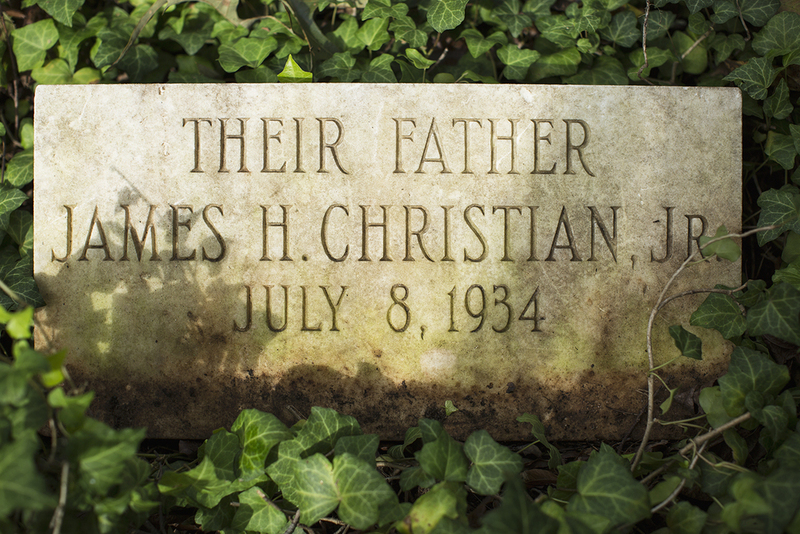 A car leaving neighboring Evergreen Cemetery on the access road passed by slowly as we walked in the section of East End that straddles the Richmond–Henrico County border. The driver, a man or woman sunk deep into the seat—perhaps just a really short person—drove on without looking. We visited today to photograph a headstone for a Richmond couple we met last week, at our exhibition. They share a family name with the deceased. They have people buried at Evergreen, but they knew nothing of this particular (possible) relation interred at East End. We offered to send them the photo. Erin promised to do some research, online and at the Library of Virginia. I got stung by a yellow jacket through my pants as Erin unearthed a grave stone. She found others and temporary markers, too. A number of these were for children. 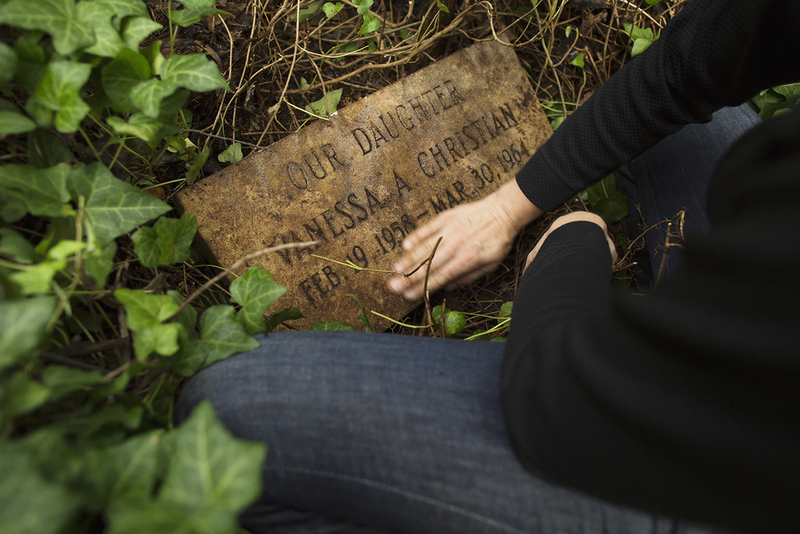 We know that they died a long time ago—six-year-old Vanessa Christian passed away in 1964, a few months before I was born—but we always feel a wave of sadness when we find them. Erin may write more about this. I have never been able to photograph the depressions that corrugate some sections of the cemetery, graves marked and unmarked, to my satisfaction. I tried again today. They remind me of the graves at Old Orchard Cemetery at Camp Peary, the first place I truly noticed these casket-shaped troughs. We will probably never learn who is buried there. The shapes in the ground force me to visualize a coffin, which sends my thoughts toward funerals, real and imagined. As I child, frightened of anything having to do with death, I would have been pants-wetting terrified of these dips in the earth. Now, I tread lightly around them, respectfully, but also curiously. The souls at rest under my feet have stories.